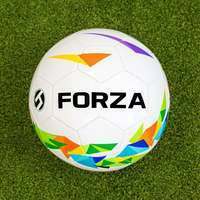 3m x 2m FORZA Alu60 Football Futsal Goal. Official regulation size futsal goal made from 60mm powder coated aluminium with a rot-proof HDPE goal net. Single or pair. 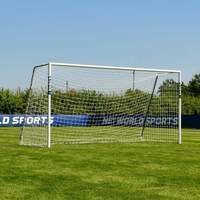 Meeting official internationally-recognised size regulations, this 3m x 2m football goal has been designed to add a premium touch to futsal matches and tournaments. 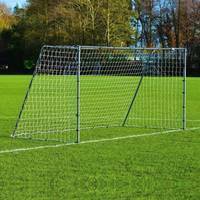 Suitable for use on indoor pitches as well as outdoor surfaces, this versatile futsal goal is a real game-changer. Built with the strength to last for countless fast-paced futsal matches and training sessions, the 60mm reinforced aluminium goal is a jack of all trades, as its frame is light enough to be carried by two people. For quick and easy storage, the foldaway steel side frames are easy to use. 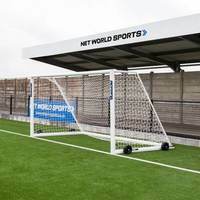 While futsal is more evocative of eye-catching skills in the blistering South American sunshine, the weatherproof posts and HDPE goal net bring the heat during all weather conditions. This all-weather futsal goal is capable of being left outdoors without falling foul to rust and corrosion. 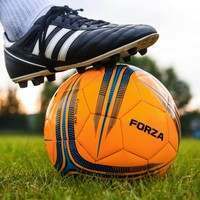 Futsal is making waves throughout the beautiful game, striking a chord with football purists due to its technical and skill-based nature. 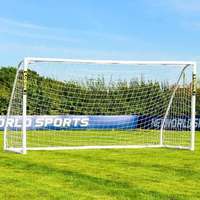 This official regulation size 3m x 2m football goal for futsal delivers the heat of breathless, thrill-a-minute action to playing venues up and down the country. 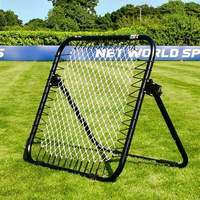 Suitable for indoor or outdoor use, this aluminium futsal goal can be used for back garden skill training sessions, fully-fledged tournaments on indoor hard courts and even small-sided beach football kickabouts. This versatile futsal goal is as revolutionary as the game itself. 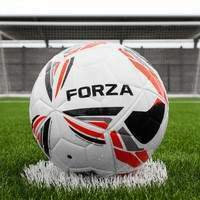 From rigorous skill coaching sessions to the cut and thrust of a competitive futsal tournament, the sturdy manufacturing of this 3m x 2m football goal for futsal can handle whatever comes its way. 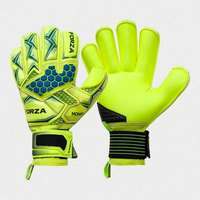 The 60mm reinforced aluminium framework is highly reliable, ensuring that it won’t come unstuck when faced with powerful skill shots. 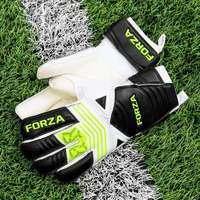 Providing seasons upon seasons worth of use, this high value professional quality futsal goal has the durability to become a mainstay of your set up. Powder coated in a classic white, the weatherproof frames can perform optimally both indoors and outdoors. Take your aluminium futsal goal on the road. 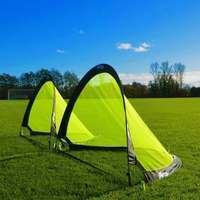 High in strength while maintaining a light in weight touch, the portable futsal goal can be shifted up and down the pitch by two people, providing premium mobility to match its heavy duty design. 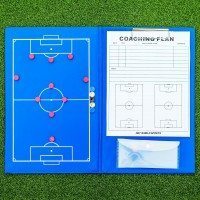 While futsal is typically played in indoor hard courts, the versatility of this aluminium futsal goal means it can be utilised on any surface, making it perfect for coaches, sports centres and schools as well as clubs. 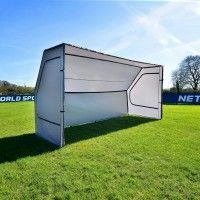 The weatherproof futsal goal can be left assembled outdoors, although should you wish to store it away post-use, the space-saving foldaway side frames facilitate simple storage. 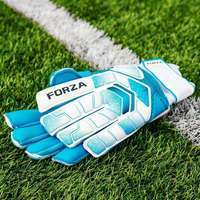 These cutting-edge futsal football goals have the mark of approval, as they have been tested to BS EN 8462 safety standards. 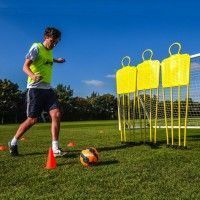 Designed to remain stable and secure throughout rapid matches and coaching sessions, the sturdy aluminium futsal goal is the best 3m x 2m football goal on the market. 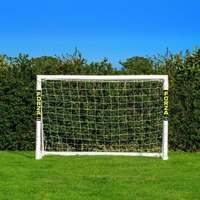 Lining up alongside the highly durable goal posts is an equally weatherproof HDPE braided goal net, finished in a classic white to merge tradition with a modern twist. 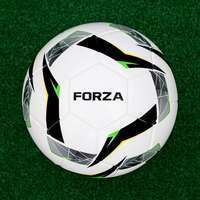 Add a premium edge to small-sided futsal matches and training sessions with this 3m x 2m aluminium futsal football goal. The specs say: Galvanized steel foldaway side frames Quick release galvanized steel detachable back bars Does that mean they are easily foldable for storage purposes? Hi Duane, thank you very much for the enquiry. Yes, that is correct, you can remove the bottom back bar, this allows the sides to fold in and make the goals easy to store. 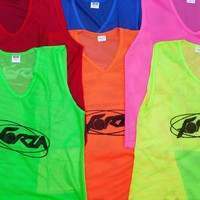 What is the depth of these goals?